Last weekend saw Murty steadying the ship and producing a good performance away at Hearts with a 3 – 1 win. Situation was geared up for Kenny Miller who didn’t disappoint with his return from exile and appointment as Captain by scoring 2 goals. This weekends game is a home fixture against Partick Thistle on Saturday 4th November with a 7pm kick aff Baku Time. Game will be shown in the Bear Pit via RTV. This week saw Scott Westwater leaving Baku, thanks Scott for your assistance as Treasurer and all the best for the future. It was a quiet weekend last week with the international break, Scotland managed to do the normal and not qualify and seemingly we as a nation are now all too wee to play international fitba. The Clansman hosted its first Charity Race Night and after a frantic start raking around for a dvd player the night went very well with a total of 3,500AZN raised for charity. Many thanks to all those to sponsored a race or participated on the night, also thanks go to all the committee who arranged the evening. Further details of the charities that the money will go to will be announced shortly. If anyone has any photos of the evening can they forward onto me. This weekends game sees us travel to Perth to take on St Johnstone tomorrow ( Friday 13th October) with a 22.45 kick off. The game will be shown in the Clansman as normal. A mixed week has just past, a draw against Partick Thistle in the league game on Friday night saw us take 3rd place in the league after other results went our way and an extra time win against Partick Thistle in the Cup saw us progress to the semi final where we have been drawn against Motherwell. This weekends game is of course the first Old Firm fixture of the Season at Ibrox. Game is tomorrow ( Saturday) with a 3pm kick off Baku time. The Bear Pit will be open from 2pm for members and their guests only, for anyone else they can watch the game upstairs in the Clansman. The beer cozies have arrived and have almost sold out already, there is a limited amount available for sale on Saturday but we have put in another order for more so people are not disappointed. If anyone is wanting to get tickets for the semi-final can you please reply to me before Monday so I can put an application into Ibrox. If we cannot satisfy the demand from members there will be a ballot for the available tickets. Roll on tomorrow and lets get right into them. Last weeks win against Dundee moved us up to 4th in the league 3 points behind them and the Sheep and 1 point behind St Johnstone. This weekend sees us playing the first of 2 back to back games against Partick Thistle who are currently joint bottom of the league with Dundee and Kilmarnock. Game is tomorrow ( Friday) with a 10.45pm kick off. the Bear Pit will be opened up if there are enough people there, if not it will be shown upstairs in the Clanny. 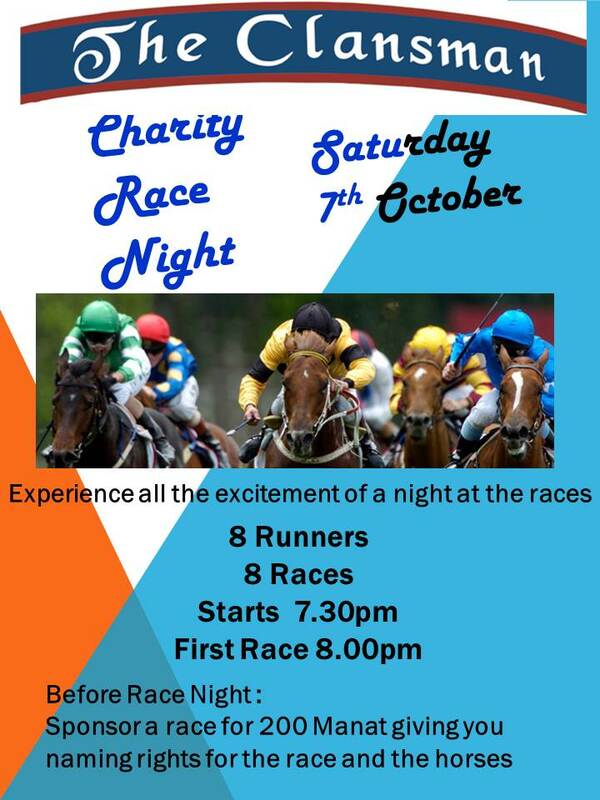 As mentioned last week the Clansman will be holding a Charity Race Night on Saturday 7th October. As part of the event we are looking for sponsors of the 8 races. Sponsorship will cost 200 manat and you’ll be able to name the race and also the 8 horses running in the race. If you are interested in sponsoring a race drop us an email or see Les Tulleth or any committee member. Attached is a poster advertising the night for you to print out and stick up at your workplace. The club will be receiving beer coozies hopefully next week. Photos of the front and back are below. They will be priced at 7 manat each or 6 for 40 manat. We are taking orders for them so if you want them drop an email so they can be reserved as we expect them to go very quickly. That’s the International week aff all done so its back to league business this week. Oor game this weekend is against 2nd bottom club Dundee at Ibrox. Dundee have only drawn 1 game so far this season scoring 3 goals and conceding 8. Game is tomorrow SATURDAY 9th September with a 6pm kick aff Baku time. Game will be shown in the Bear Pit via RTV as normal. The club now have new membership cards made for all 2017/18 members and these can be picked up from tomorrow. The membership card will entitle the holder to a 10% discount off their swally and food bill in the Clansman. A good away win last weekend away to Ross County saw us move up the table to 5th spot 5 points behind the sheep who are topping the league after 4 games. The transfer windae closed last night with the expected transfer of Jamie Walker fae Hearts not materializing so maybe a pre contract singing in January on a free ? We did however sign John Declan on loan from Cardiff until the end of the season. Dodoo has gone on loan to Charlton till January. The committee had their first meeting of the season on Wednesday where a few ideas were proposed, news to follow shortly. However one thing that we did decide on was that the Clansman will be holding a Charity Race Night on 7th October, further details will be sent out asap. Monthly members meeting date and time will be announced next week. Its not been the start of the season we were all expecting, only taking 1 point out of our first 2 games at home is frustrating but hopefully things will turn around soon ( for Pedro’s sake it better happen soon). This weekends game is an away trip all the way up the A9 to Dingwall where we will play Ross County, a team we didn’t manage to beat last season, game is on Sunday with a 6pm kick off and will be shown in the Bear Pit as normal. As previously mentioned next weeks update will be sent to 2017/18 season members only, if you don’t get the email you either haven’t paid or we have fecked up with adding you to the members list, get in touch if this happens. I have an apology to make from the email that was sent out on the 11st August where mention was made about the Orange beached whale. The RSPCA have been in touch and we would like to categorically state that there was no cruelty involved with the particular mammal being in the Bear Pit !!!! Congratulations to Beattie fae Dumfries who was a winning member of the golf team at last weekends tournament at Dreamland. Seemingly the Baku Bears Vice President had to take to his bed for the rest of the week after the result !!!! It was another good week for Rangers, firstly getting the opening season off to a good start with 3 points after a very competitive game away to Motherwell and also beating Dunfermline 6 – 0 in the Cup at Ibrox on Wednesday night. This weeks game is at home to HIVS, tomorrow Saturday 12th August with a 6pm kick off Baku time. Game as always will be shown via RTV in the Bear Pit. Thanks to Andy Halliday for coming down to the Bear Pit last weekend, lots of photos were taken most of which seemed to have ended up in the Daily Record on Monday. No quite sure what Scottish readers made of the Orange beached Whale in one of the photos !!!! Gordon (aka Sick Note) has requested that members go to the following link. This is for the SFA & SPFL recognise Rangers Wartime titles and these be added to our count of 54. Is there anyone wanting to go and watch Qabala playing Panathinaikos in the Europa League qualifying round this Thursday. If so we will leave the Clansman at 7.30 to head up to Bakcell Arena where we can purchase tickets. Firstly apologies for the broadcasting issues for last Saturdays game, everyone was trying their best to get the game on but there was a problem at the RTV end which shouldn’t come as a surprise as its been the same the start of at least the last 3 seasons. Anyway thanks to all those who were trying every avenue possible, we managed to log into RTV on 41mins to watch the rest of the match. Also thanks to those who turned up for the AGM. Minutes of the meeting will be available at the club. I have just found out via NARSA that the friendly against Sheffield Wednesday will be shown on RTV (though RTV website doesn’t say so !!!). Match kicks off at 6pm on Sunday and the Bear Pit will be open and showing the game. Membership fees are now due for this season and attached is the application form. It has been confirmed that RTV will be showing the match today and seeing as I fooked up with the timings the AGM will be held immediately after the game. Swally – all day !!! With the start of the season fast approaching the club will be holding their Annual General Meeting in the Bear Pit on Saturday, 22nd July at 6pm. Hope as many people as possible can make it. We are waiting to find out if Rangers TV will be showing the friendly home game against Marseille which will kick off at 7pm on Saturday. If it is being aired then the Bear Pit will be showing the match. Gabala v Jagiellonia – Andy Halliday Loyal European trip !!!!! As your all aware Andy Halliday has joined Gabala and they will be playing Jagiellonia from Poland in the Europa League this Thursday 13th July. Are any of you wanting to go to the match and cheer on Andy, if so can you let me know as soon as possible. Game kicks off at 9pm and is at the Bakcell Arena. I have been told that we can purchase tickets at the ground. The past retail deal with Sports Direct was torn up and a new deal put in its place allowing the club to take in more of the proceeds from the replica shirts. Rumours state that this could allow the club to rake in 5 Million per season and judging by the way the Superstore at Ibrox sold out in hours of the deal being announced may well be true. Ashley sold his stake in the club with 50% being bought by Supporters group Club 1872 and the other 50% by Julian Wolhardt the chief executive officer of Dehong Capital Partners, a private equity firm based in Hong Kong. Club 1872 are now the 2nd biggest shareholder. Portuguese defenders Bruno Alves and Fabio Cardoso and compatriots Dalcio and Daniel Candeias, who play in wide attacking roles, as well as Colombian striker Alfredo Morelos and Mexican duo Carlos Pena and Eduardo Herrera – a midfielder and a striker – have joined midfielder Ryan Jack in moving to Ibrox this summer. Rob Kiernan, Andy Halliday, Matt Crooks, Harry Forrester, Michael O’Halloran and Joe Dodoo. It looks like they could well be on their way out of Ibrox. Andy Halliday was quoted yesterday as being on a possible 1 year loan deal to Azeri side Gabala, wonder if we will manage to get him down to the Bear Pit this season? Our Season starts off this Thursday night (29th June) with a Europa League1st Round tie against Progres Niederkorn. Its a complete sell out at Ibrox for our first European game in a number of years. Game kicks off at 22.45 Baku time and will be shown in the Clansman, come on down and watch the game. The AGM will be held in the coming weeks and the date will be sent out shortly. There will be positions on the committee available so if anyone would like to assist keep the club running please let us know. This weekend see a group of around 300 Northern Ireland Supports travelling to Baku for their World Cup Qualifying game against Azerbaijan. A number of Rangers Supporters have been in contact with the club and will be making use of the Clansman over the weekend. Hope that as many members as possible will be able to frequent the Clansman this weekend to provide them with a friendly and warm welcome and promote both the Baku Bears and the Clansman. The Clansman will be having early opening and last man out closing to accommodate the guys. This Saturday also sees Scotland v England World Cup Qualifier with kick off at 8pm Baku time, game will be shown on all the screens in the Clansman. The draw for the first and second round Europa League matches will be made on 19th June with first round games being played on 29th June and 6th July and second round games being played 13th and 20th July. The 3rd round draw will be made on 14th July with games to be played on 27th July and 3rd August. Below is a listing of the possible opponents we may face CS Fola Esch – Luxembourg, Shamrock Rovers – Ireland, Lincoln Red Imps – Gibraltar, Dinamo Batumi – Georgia, Bangor City – Wales, B36 Torshavn (Faroe Islands), Siroki Brijeg (Bosnia), Differdange 03 (Luxembourg), Shkendija Tetovo (Macedonia), Nova Gorica (Slovenia), Pyunik Yerevan (Armenia), Mladost Lucani (Serbia), Partizani Tirana (Albania), Flora Tallinn (Estonia), Chikhura Sachkere (Georgia), FK Jelgava (Latvia), SJK Seinajoki (Finland), Cork City (Ireland), Zets Golubovci (Montengro),, MFK Ruzomberok (Slovakia), Derry City (Ireland), FK Liepaja (Latvia), Zaria Balti (Moldova), VPS Vaasa (Finland), Valur Reykjavik (Iceland), Vasas Budapest (Hungary), Atlantas Klaipeda (Lithuania), Suduva Marijampole (Lithuania), Tre Penne (San Marino), Bala Town (Wales), NSI Runavik (Faroe Islands), Balzan FC (Malta), Connah’s Quay (Wales), UE Santa Coloma (Andorra), Progres Niederkorn (Luxembourg), Pelister Bitola (Macedonia), Coleraine (Northern Ireland), Ballymena United (Northern Ireland), Folgore (San Marino), Floriana (Malta), Sant Julia (Andorra), KI Klaksvik (Faroe Islands), St Joseph’s FC (Gibraltar). If any of the members will be looking for Europa Cup tickets we have registered with Ibrox and should be able to accommodate any requests subject to availability. Sorry for lateness but todays game against Partick Thistle is being shown in the Bear Pit with a 3.15pm kick off Baku time. A good win against Partick Thistle last week see’s us going into this weekends game with 2 wins on the bounce with no goals conceded in the last 3 games. It’s the big one this weekend with a trip to Hampden to play the soap dodgers in the semi-final of the Scottish Cup. Last weeks game ended up being a right cracker against the Mutton Molesters, a magnificent 5 minutes saw us skelping 3 goals into the pokie ensuring that the Grampian Fire Brigade had a very quiet night as there were no reports of any sheep on fire !!! This weekend’s game is at Home against Partick Thistle, kick off is 6pm Baku time and game will be shown via RTV in the Bear Pit. Just a reminder that there will be a members meeting tonight in the Bear Pit at 7pm. Hope to see as many as possible.